Lindsey Graham, drone attacks: Threatens jokingly (?) to kill Americans. 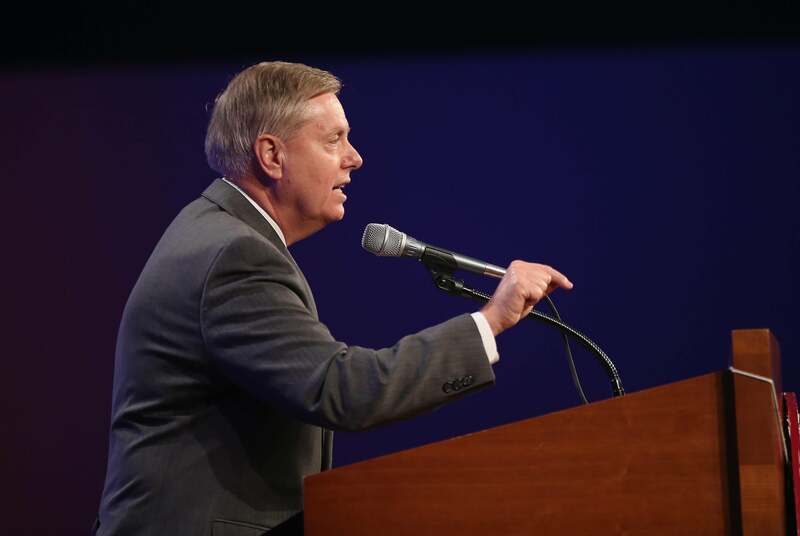 South Carolina senator Lindsey Graham speaks at the Republican Party of Iowa’s Lincoln Dinner on Saturday in Des Moines. Needless to say, ordering domestic drone assassinations of United States citizens who are considering joining a terrorist organization—again, Graham’s audience, which he addressed in the second person, was in Iowa—would be an extreme escalation of a tactic that’s already controversial even within Graham’s own party. Even assuming that Graham didn’t mean what he literally said with his mouth and was referring only to overseas targets, the statement is still insane. Many ISIS recruits notoriously come from Europe. Is Lindsey Graham suggesting that as president he would send drones to attack targets in Paris and London because of intelligence that indicated a resident there had been reading about ISIS on Facebook? For someone who is about to make his mastery of the foreign policy game a major part of his presidential campaign, Graham’s statement is not a strong opening. And if indeed it was meant as a joke—which is not indicated in the delivery at all—Lindsey Graham is very bad at humor.